For the last couple of years, I have seen several raves about Vingenzo’s, in Woodstock. The gist of all of them was that it was definitely worth the trip OTP (outside the perimeter). When Friday night rolled around and we had no plans, I made a reso via Open Table and we made the thirty mile (one hour+ in traffic) drive from the house. Vingenzo’s is located on Main Street in downtown Woodstock, right next to a city park with plenty of parking. When we got there, about ten minutes late due to traffic, the place was packed. 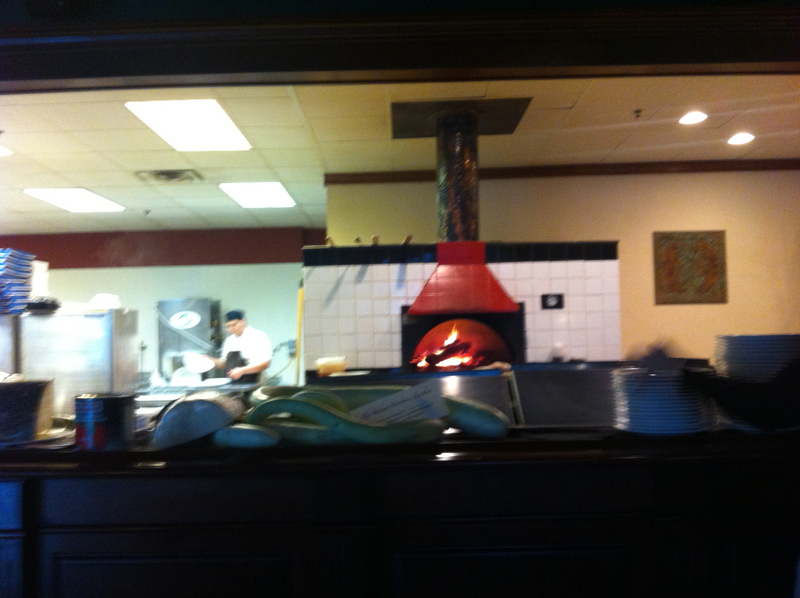 We waited a few minutes and were shown to a table next to the wood fired oven. 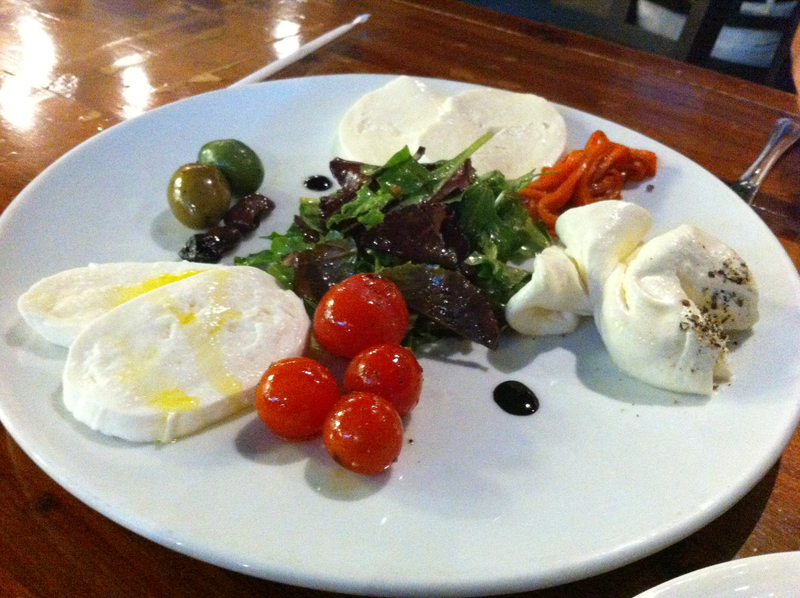 They’re known for their house-made mozzarellas and pizza, so I had an idea of what I would be having. One of the reviews that I read while we were waiting for our table said that everything was sourced and made fresh, to the extent that they don’t have a walk-in freezer. We started with the grandioso tasting – a platter of three of their mozzarellas (Fior Di Latte, Stracciatella Di Burrata & Bufala) with roasted tomatoes & peppers, Cerignola olives, handpicked Pantelleria capers & oven roasted Taggiasche black olives. Jo preferred the one closest to the red peppers (cow milk-based – it was the firmest of the three and had the strongest flavor) and I preferred the one next to the tomatoes (water-buffalo milk-based – which took on the flavors of whatever it was paired with), but the third one (goat-milk based was mild and creamy) was good, too, and we cleaned the plate. In fact, we asked for bread to go with the goat milk-based mozzarella and when it arrived, we were surprised. The bread arrived at the table as what I thought was a loaf. At least until I tried to cut it. 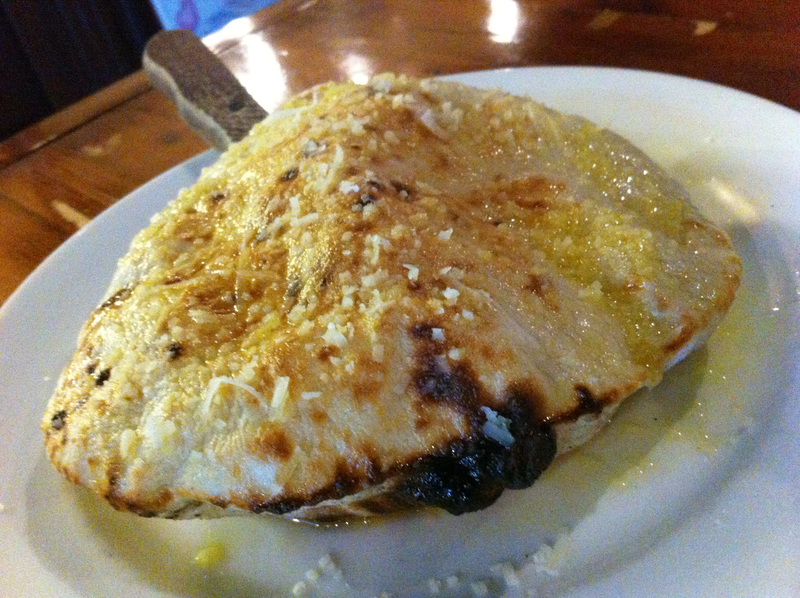 Then it deflated and ended up like two pieces of cracker-like bread, covered in olive oil with some air in between. A little of the last mozzarella smeared on this bread with some of the roasted tomato made for a mighty fine snack. Jo ordered Funghi d’Estate – wild mushrooms, basil, roma tomatoes and extra virgin olive oil. The waitress told us that all of the sauces were made to order and the sauce on this one tasted fine and fresh, but I avoided the mushrooms. Jo said that it was good, but no mushroom pasta dish compares in her mind to her favorite at La Tavola Trattoria. 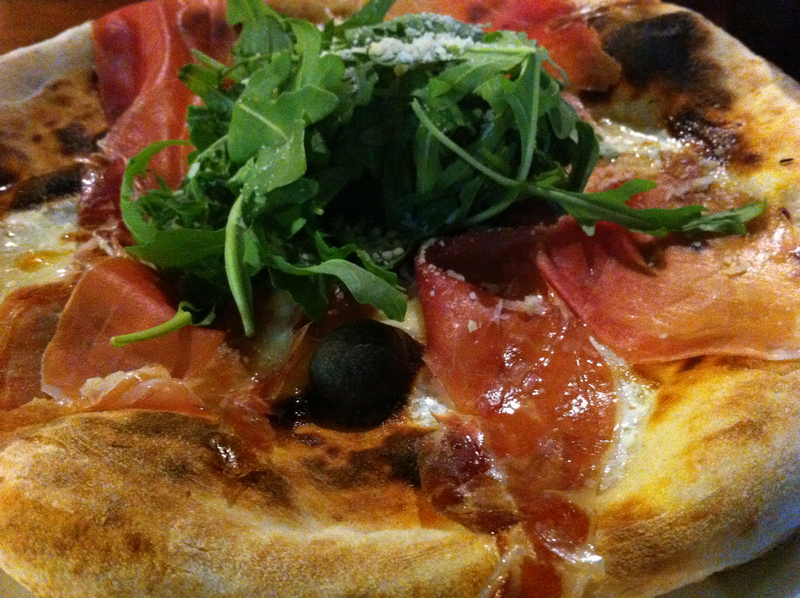 I ordered a pizza, the Sofia, with arugula, prosciutto and aged parmigiano. The pizza was 10-11 inches in diameter and was covered in thin slices of proscuitto with the arugula stacked in the middle. One of the things with wood-oven baked pizzas is the “burn spots”. Everybody loves them. “They show the imperfection of the oven.” “They are the hallmark of hand-crafted pizza.” But those spots taste like burned bread, to me. And there were plenty of them on this pizza. The food was good and the price was reasonable, but I don’t know why I’d drive there as opposed to Antico, or even Fritti, if I was in the mood for good pizza.